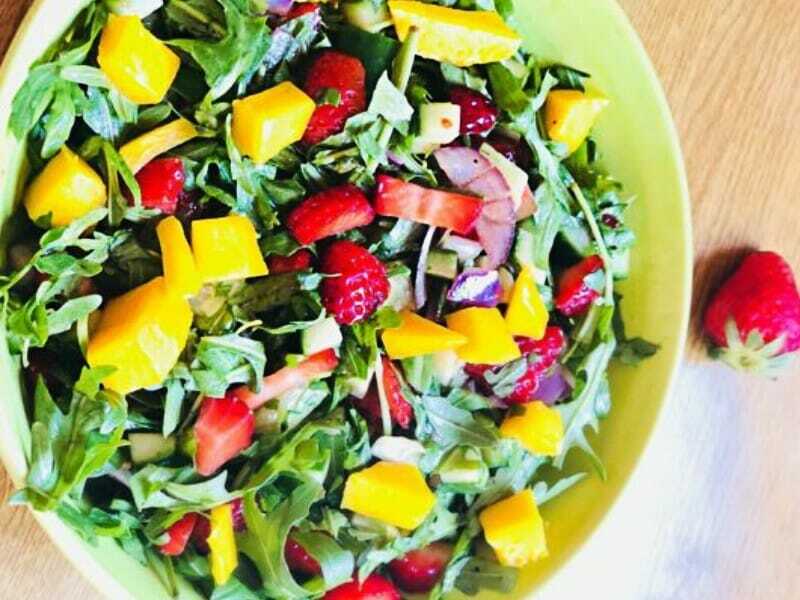 A Spring/ Summer salad with strawberries, fresh rocket and mango in a tangy spicy mango chutney dressing brought together in just 10 minutes. SALAD! Does that draw a picture of a bowl of assorted green colour leaves, specks of cucumbers with hints of red in the form of cherry tomatoes with a usual dark brown or white dressing drizzled on the top? Well, that is what I was accustomed to. Until recently, I discovered the various combinations that go into making these otherwise green healthy bowls into some sort of exotic artistic palates! One of the greatest revelations to my taste buds was the addition of diced or chopped fruits to green leafy salads that changed the whole flavour spectrum. Fruits added to an ordinary mix of leaves and salad vegetables such as cucumbers, tomatoes, raddish, peppers, celery gives a salad a natural tangy sweetness and breaks the monotony of blandness. This also means that you do not have to take that extra step to make complex or heavy salad dressings to add flavour to a bowl. A salad made with fruits and vegetables not only enhances the taste but also has added health benefits too! It’s almost like eating your 3 parts of 5 a day diet! Spring and summer time is perhaps the best time of the year to get an abundance and variety of fruits and salad ingredients. A cool, crisp light salad with colourful fruits makes for a great healthy quick summer meal that is full of antioxidants, vitamins and minerals! Just what to need to maintain that bikini bod! Making salad becomes quicker if you have the right kind of gadgets which makes chopping a piece of cake; or in this case a bowl of salad! This summer salad was put together as a spur of the moment thing post my shopping trip. I had bought some fresh rocket leaves and strawberries (amongst the hundred other bags) and was starving after the long day at the aisles! There were no leftovers for me to go to, so I opened my newly purchased produce and started to put together flavours that I wanted to eat. In this case it was the bright green rocket leaves and juicy red sweet and tangy strawberries. I also had half eaten mango which I tossed in too! There is absolutely no reason for you to stick to the same salad ingredients that I have used. Feel free to make your own combinations. For the dressing, I fancied something spicy and non-vinaigrette dressing, so came up with the idea of making one with some mango chutney from the jar. The reason for me to share this recipe with you is that I would like you to try this unique yet effortless dressing. The use of mango chutney as a dressing gives the salad a spicy tangy sweet taste that really tantalises the taste buds! What did you think of this easy to put summer salad recipe with fruits? Please do share your favourite combinations for me to try this summer. I love using fruit in salads but have never tried adding mango! Delicious! Hi Emma! Please do try and add mango to your salad especially if they are the ripe sweet once. You will enjoy it. Looks like a delicious and refreshing salad. I like your idea for using mango chutney for dressing! It really is. Hope you get to try it. The hot and spicy mango chutney dressing gives it a very sweet tangy refreshing taste. Love all the colors and flavors of this salad, sounds perfect for summer. Thanks Caroline. This was such a spur on the moment salad that even I was impressed by its outcome. Hope you get to make this salad.It really is easy and fast to put together. I love arugula (also called rocket) but have never grown it myself. Something new to try in my garden!. I love the peppery flavor it has. Love your salad idea. Thanks Markus. Hoep you get to grow your own leaves this year. I love a fully loaded salad like this! My favorite salads have fruit in them too and I love that you use a variety to go with the rest of the savory salad. So yummy! Really enjoy how sweet fruits cuts through the saltiness of the salad and give it such an exquisite taste. so many wonderful ideas here! I’ll have to see if I can find some rocket! 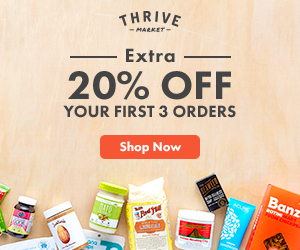 Do you forage yourself for it? Yeah! In the supermarket :-)! I am afraid I don’t have green fingers, so its the health food store/supermarket for me. Rocket is Arugula in North America. Easy to find. YUMMY peppery flavours. Looks really beautiful + perfect summer salad.Love the mango chutney in the dressing!! I love quick and easy salads like this one! I have to make that dressing. Sounds so amazing. So perfect for summer! Making this ASAP! What a great summer salad! Plus you just can’t beat mangos and strawberries together, they’re one of my favorite combos! really easy to put together. The dressing tastes yum. Do try if you can. I had to look up rocket because I didn’t know what it was! Yummy and refreshing salad!